“The ancient trail, where particularly tricky passages have been marked with clumps of wood painted in the Sámi colours, follows the terrain in an exemplary way in an easy and exciting landscape”, says Tor L Tuorda, who also took the photograph. The trail was formerly used as a trade route and a link for people in the immediate area. During the Second World War Rádjebálges was also a frequently-used route for refugees fleeing from Norway to Sweden. The area around the trail is characterised by reindeer herding. At many places there are green and verdant reindeer pastures that were used in the past when reindeer were milked. Nearby them there are old dwelling sites. On the Swedish side there are stopover cabins with toilets and firewood sheds, and on the Norwegian side there are sleeping cabins. You can shorten the tour by taking a boat on Lake Áhkájávrre or you can hike the entire trail from Rijtjem. From Sørfjord, there are boats to Gásluokta/Kjøpsvik in Norway. The best time to hike the trail is June – September. Bierdnaoaivi: Bear’s head, or rock? Near the trail on the Norwegian side of Rádjebálges you can see Bierdnaoaivi, a rock in the shape of a bear looking up towards Bierdnačohkka, Bear Peak. The rock has also given Lake Bierdnajávri its name. The stone wall: At Riddaborri there is a stone wall built in a narrow passage to stop reindeer. War relics: along the trail there are old sentry posts and other relics from the Second World War. The Sámi name for Sørfjord is Slábavuodna. Rádjebálges means border trail, but people passed here before there was a border between Norway and Sweden. You can also hike back to Norway or Sweden on the trail from Vuotnabahta/Hellmobotn–Vájssáluokta and from there take the boat to Rijtjem. 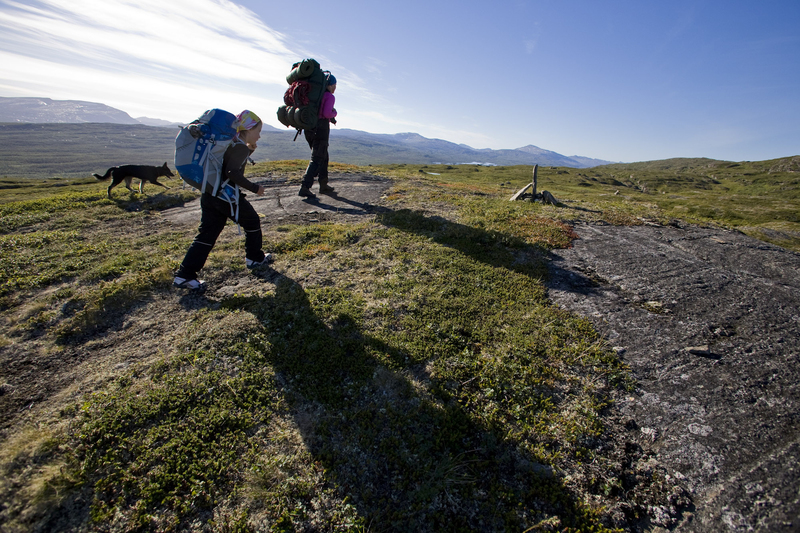 The large number of stopover cabins makes it a good hiking trail for families with children.